Ok, so being a landlord is hardly a profession which requires a degree or other formal qualifications. We’re not going to save lives with our medical expertise or improve the world with great engineering feats. However, every day, in our small world, we deal with good tenants, clever tenants, unbelievably daft tenants and downright manipulative, difficult tenants. The phone rings late one night last week. It’s Erica, sobbing hysterically down the phone in broken English that her new husband, Harry, had been taken into custody and she didn’t know what to do. Harry and Erica married last month; she’s Polish in her late thirties and he’s Indian in his mid twenties. She swears to me it’s mad, impulsive, passionate love and he just smiles and nods in agreement. They’re hard working, quiet, pleasant and an asset to the house and, quite frankly, anyone who can put up with binge drinking Tom and not moan to me about it, becomes a star tenant. I’ve been reviewing the blog recently and decided that, after seven years, I am no longer a Novice Landlady. Having said that, I’m not an expert in HMO legislation either – I’ll leave the ever changing rules to solicitors such as David Smith of Anthony Gold solicitors and local authorities who are paid far more than I to translate all the finer points. Thank you to everyone on Twitter who consider me to be more well versed in this area and I’m just grateful we have a great HMO council department who trust me to do the right thing within the boundaries of the aforesaid legislation. So, do I carry on with the blog as a journal, bringing you my tenant stories interspersed hopefully with a few nuggets of useful tips and information or do I make it more of an educational “How to run an HMO”? Readers are very kind with their comments and often ask questions such as where they should invest, what yields I achieve and the finer details of how to make their venture into HMOs a profitable one. I’m only one of many thousands of landlords (many of whom are making far more profit than me) and enjoy bringing the realities of the coalface to any new investor who thinks it’s all about yield. Having said that, for a hefty fee, I’ll happily come out and show you how to set one up and interview tenants!! If you’re looking to chew the fat and debate the pros and cons of property investment, I heartily recommend Property Tribes, The Property Hub and Property 118 where you can connect with property people nationwide. They are all online to give you their opinion and benefit of their experience but it’s no substitute for getting down and dirty and throwing yourself into the practicalities of BTL. These sites weren’t around when I started and desktop research had little to offer. As with Channel 4’s Undercover Boss, there’s no better way to understand your business’ strengths and weaknesses than experiencing all aspects of the work for yourself. Once you know what makes your property profitable, then you can hand it over to a letting agent if you like. With the acquisition of a new computer, I’ve decided to better systemise my business by creating tenant records and scanning in all their documentation then storing it somewhere between earth and Heaven. At present, I often begin conversations with tenants “Remind me, when we last spoke….” or scrolling through texts to find out exactly the terminology one tenant used to slag off another. In the same way that Miranda Hart promised herself to become a “new me” by power walking wherever she goes, drink fresh juice and eat homemade muffins, I aim to stop carrying around my tenant’s emotional baggage and rifling through Tenant Information Forms for email addresses that the cat’s been sleeping on. Try to assist a pedantic long term tenant who says he’s living with damp, when all I can find is a small brown stain on the ceiling 20 feet away and he won’t give me permission to send in a decorator. He wants fifty quid “for materials” to do the work himself. Worst Investor or Best Landlord of 2013? Six years ago my Ex and I were persuaded to buy BMV (Below Market Value) properties in the North of England. On paper, they looked like good investments and, during a time when one only needed to be able to sign their name to be granted a mortgage, it was easy. A letting company “only” charged us £2,500 to find each property and £5,000 to refurbish it, promising immediate equity of £20,000 to £30,000. A few of these under our belts, and next year we could be millionaires, Rodney. Following the split I agreed to sell what I could. The first property took six months to sell and achieved £15,000 under the perceived original value although I was grateful to be rid of it. I instructed the sale of the next one, with a tenant in situ, but after a year of being on the market and only one vague offer which barely made it to exchange I took the decision to find another agent and help the tenant to move on with a cash incentive to aid their moving costs and market the property with vacant possession. The agent told me it was easily worth £90,000 and with a £70,000 mortgage and £2,500 agent’s fees, I comforted myself that I would finally get something out of the house after sinking thousands into it for repair, maintenance and buying costs. After weeks of no interest, the agent persuaded me to try their auction house for “only” £5,000 selling fees as it was sure to generate some activity there. Three months later and I was offered, £55k, £60k and £65k. It was a sure bet that my Ex would be unwilling to share the loss so, for the last two months, I’ve sunk another £8,500 into its long needed refurbishment, changed agent and put it back on the rental market at a rent of £550 per month. After agent fees and mortgage, it’ll take 60 months or 5 years to repay the investment omitting any capital growth in the north of country. With head held high, desperately trying not to weep at having to spend hard earned savings on the stupid house and consoling myself that at least I was reinvesting rather than having to look after an empty, risky property or give funds to the mortgage company the agent called this week to say they’d found a tenant. “Great! Brilliant! Get them in!” I said. “Well, the only thing is” said the agent “That she’s lived there before and wondered if you’ll have her back? She said she loved it so much, didn’t want to leave and said you were a great landlady who sent them chocolates every Christmas.” So, after months of paying a mortgage, council tax, insurance and utilities for an empty property, dug deep for refurb costs, spent hours finding a decent agent and agonising over turfing a good tenant out of their home, it’s gone full circle and she moves back in at the beginning of January. Back on home turf, Tom lost his job, Sarah has discovered a ghost and my son received the most thoughtful Christmas present ever. Tom lasted three and a half months in the warehouse of a big company. To be fair, it was two month’s longer than any of us thought he would before he either killed someone whilst driving a forklift under the influence or his vital organs gave up trying to digest the fruits of his overtime pay. I really do think he enjoyed being a regular, employed person but perhaps he just didn’t have the stamina to stay out of the pub. Sarah cornered me the other day to say that she’d managed to get hold of a radiation meter to check the levels of her room. According to her, all the rooms in the house are clear except hers. She saw my look of alarm and put me at ease by saying that this could be due to the wifi signal but is more likely to point to the existence of a ghost which she is trying to negotiate with. She suspects it’s a child and she’s working with it to help it move on to the other side (this could be true as the house used to be home to wayward teenagers) and assured me she’s content to live with a “squatter”. Finally, this weekend I dragged my seven year old son round to help with rent collecting. Tom shoved a bag into my hand and whispered “give this to George at Christmas”. “No” I said “You give it to him so he can thank you personally”. 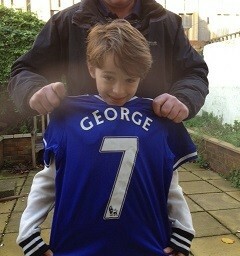 As George unwrapped the gift his eyes lit up to find a Chelsea football shirt with his name and age (7) on the back, signed by all the players. “Tom? Is this legit?” I asked. It had to be as the odds of finding a shirt with my son’s name and age written on were a long shot. He replied “I know a bloke in the pub who owed me a favour and works at Chelsea”. George was so bowled over, it brought a tear to Tom’s eye so I gave them a tenner and sent them off to McDonalds for some mutual appreciation where they bumped into my eldest daughter who didn’t think twice to question why some middle aged bloke was buying my son a Happy Meal! This week threw up an interesting case: I met a young girl called Kirstie at our local homeless charity. She had been accepted on a 12 week “back to work” programme helping out in the shop and organising the meals for the Drop In Centre. The support workers had asked me to meet her with a view to letting her a room but decided to be slightly economical with the truth – “lovely girl”, “good worker”, “just needs a chance” whilst looking shiftily over my shoulder. Regular readers will know that in the past I’ve taken just about anyone on providing they can string a sentence together and aren’t displaying any obvious signs of substance abuse. However, after my narrow scrape last time, I’ve decided to be a bit more cautious as I’m letting the room on behalf of another landlord. On meeting her she came across as a scrap of girl, vulnerable, bewildered and happy to let everyone else talk for her. When I asked about references they all nodded and said “No problem. Her Social Worker, Foster Carers and Probation Officers can all give her a reference”. I bet they bl**dy well could – anything to get her off their case list as she’d just turned 19 and I guess was about to be unceremoniously evicted from the care system that has been supporting her. During the interview it was difficult to get a measure of HER. I wanted to see her personality, see if she really did want to turn her back on her apparently violent past and was genuinely fed up of the chaotic lives of the friends she’d surrounded herself with, but I just couldn’t find a way in especially as it felt like I had the entire homeless population of the South Coast breathing down my neck, quick to block my intrusive questioning. For the next 24 hours I pondered, wrestled with my conscience to rescue and give this little girl a clean bed in a safe environment versus using my experienced loaf and knowing deep in my gut that, by the end of the weekend, she’d have invited her mates around to see how well she’d done, they’d all decide it was warmer than their gaffs and I’d have a riot on my hands. Presumptuous on my part, yes, but I’ve been here before – several times. Time for facts: I banded her name around my existing tenants who all knew her as a feisty little thing when drunk and the family was infamous locally; Mum was an addict, step dad and dad both died from drug addiction followed shortly after by her brother, another brother was in prison and the other teenage brother in B&B accommodation until the state had no legal duty to look after him. OK, so they knew her worst side – there HAD to be a good one. I contacted the local PC who Kirstie said she had a good relationship with (never a good sign if you’re that young and know your local Bobby well). “Put it this way” he said “Last time we had to arrest her it took four officers just to get her into the van. Funnily enough I’m just going through her ASBO and typing up a possession report – I’m really not sure you’re brave enough for this one”. Pascal – reportedly ex-French Foreign Legion, alcoholic with a knife wielding girlfriend in constant tow. Asked me to marry him during the eviction process. Jenny – two kids taken away from her, several suicide attempts, part time prostitute and caused the police to kick every door in the house off its hinges. “Oh, you housed THEM?! I guess you do know what you’re talking about then” and they graciously, but reluctantly backed down. “Yes, just because you give these people good references based on their ability to turn up to the shelter remember you haven’t seen them at 1am on a Saturday night.” We calmed down and I explained that the trouble with finding their customers accommodation is not the lack of deposit or first month’s rent (that can be achieved through various council/charity run schemes) but the lack of CREDIBILITY. They turn up, have a well practised story to hand, cause chaos with other tenants and move on, unable to deal with the responsibility of holding down a job, paying rent on time and being considerate to fellow housemates. Because, for some, it’s boring, conventional and tedious and it’s much more fun having a piss up on the beach and appearing at whichever charity is dishing out the hot meal that day. While she was thinking about it, I showed her the local YMCA information. It’s sheltered accommodation with a 24 hour watch, £8 a week top up from benefits and you can only get a bed by being referred through your Social Worker. If she could do some time there, get a reference from the Manager then she’s half way to proving she would be a good tenant; the other half would be to turn up and complete her 12 week back to work programme and get a reference from them too. I’ve offered the possibility of a room which may be coming up later in the year if she can gather her references together. Will she pick up the gauntlet and prove everyone wrong or will it just be too much like hard work? She didn’t looked convinced. Afterwards I spent a bit of time with the support workers and their customers talking about the legal implications of giving someone unreliable a tenancy. We’re not all heartless carpet baggers, just fed up of having to deal with anti-social behaviour at 2 o’clock on a weekend morning. This interaction has awoken my ideal of Supported Living which you can read about here. Idealistic? Probably, but my waking hours are spent working out a viable, self sufficient plan to create something which is a combination of a Tracy Beaker style home (drama about a children’s home aka The Dumping Ground) and The Good Life – supporting vulnerable/displaced adults to become independent within a safe community. Anyone got a spare £250K and feeling philanthropic? Next Post: Besieged by tenants’ disgruntled girlfriends – why don’t they learn from “Hell hath no fury like a woman scorned”?! I’ve just arrived home from a long weekend in Florence. I could say it was to inspire a new creativity to my writing but , no, it followed an offer I couldn’t refuse. However, if I’d been a sculptor or painter of Renaissance religious persuasion my mind would be exploding with images of mortals suffering hell and damnation alongside buxom half naked women and lavishly clothed saints displayed on beautiful 400 year old frescoes. Instead, from day one I was bombarded with texts from Jamie, the potential tenant who seemed to forget what his job was or where he’d been living. Flattering though it is to boast my very own stalker, it is starting to get a bit creepy. Hmmm, I think the 20ft high statue of the naked Michelangelo’s David holds more appeal even if he was 500 years old and a bit on the quiet side. Otherwise mostly quiet from the other tenants as I’d put a note under everyone’s door explaining that I’d be unavailable (not away/abroad/on holiday – licence to misbehave) and to let them know that I wouldn’t be there for the usual rent collection so could they please exercise restraint and hold the cash for 48 hours and instructions on what to do in an emergency (call 999 for a fire, ambulance, police or the builder if they’re locked out or there’s a leak) . I’ve resorted to notes as they all seem to change their numbers or have multiple phones and I’m always the last to know. Only Andrew managed to blow his rent between Saturday and Tuesday and another tenant thought I wouldn’t notice or meant I’d be collecting NEXT Tuesday. Had a chat with Tom who said C.I.D. had popped round looking again for Andrew’s brother as well as several other people as it turns out the HMO address is being widely used by the locals whenever they get arrested. CID said “I thought the house would be bigger than this considering the amount of names we’ve got registered as living here”. Tom proudly pointed to the CCTV cameras and said “Not here, mate. They see that CCTV notice and know not to come here cos if they’re that stupid they’ll find me waiting for them behind the front door.” “Fair enough” said the copper, “I’ll put a note on the system but can’t make any guarantees you’ll be left alone”. Tom replied “It’s alright Sweetheart. None of us even get pissed anymore or walk around in our pants in case you look at the recordings”. I’ve just paid the CCTV installation bill and have decided it’s the best babysitting tool on the market – might even get one for home! HMO Landlady Places an Ad and Receives a Proposition! Spent the week painting the two available rooms to let and laying carpet – four years’ worth of spilt coffee, food and Heaven Knows What but at least it made painting easier, I didn’t have to put down dust sheets and managed to spill most of the paint on the old carpet. Placing the ads in the local paper I noticed that, when I started doing HMOs I’d get around 1 person in 10 who was working, didn’t sound pissed or desperate and understood the concept of a deposit. Now, the ads attract 9 out of 10 normal, coherent sounding people who I’d have no hesitation in meeting and was lucky enough to receive around 15 enquiries this week. First to view was Pierre, a French accountant from Paris, who looked absolutely terrified at having found himself in a small seaside town in England following a job offer. I had high hopes for the next applicant: James sounded lovely on the phone, said all the right things and we agreed to meet yesterday morning. On showing the room he kept asking questions about me so I thought “Good, he’s interviewing his landlady so it shows he has some integrity and wants to know what kind of set up we have here”. He’d looked at 14 rooms all of varying states of decay and cleanliness and was showing positive signs about this one. He told me he was 25 years old, a trainee architect in London, so it was good the house was near the station and had just broken up with his girlfriend and was fed up of living in a hotel. Wow! A hotel! Most of mine get fed up of living on a friend’s sofa or park bench. No response so I moved on to Wayne, a coach driver, who has been renting a room for two and a half years in a well known DSS hostel for £125/week. He said it was getting a bit noisy and he couldn’t get a good night’s sleep which was affecting his driving. We agreed £95/week for the room plus £150 deposit but he had no idea what Deposit Protection meant. His landlord was holding £350 and he hadn’t received any kind of paperwork. OK, so hitting on me wasn’t quite on the scale of Pascal, the ex French Foreign Legion/Special Forces commander who said “If I wasn’t ‘omeless, I’d marry you” or Pete who lay naked in bed, threw back his duvet and invited me to “Come and get the rent”, but for a brief moment it made this 42 year old believe she still “had it”! !